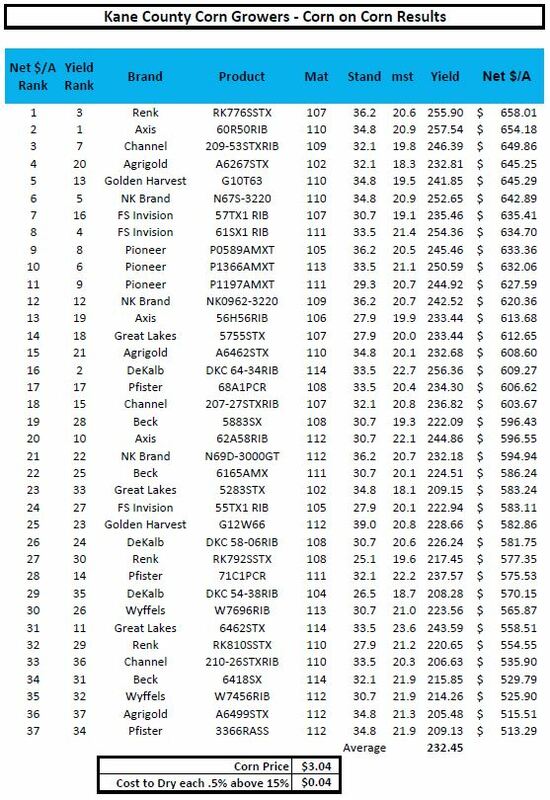 2017 Corn Variety Trials – Results Are Here!!! Thank you to everyone who entered varieties into this year’s Plot! We look forward to working with you again in 2018! This entry was posted in Test Plot on November 28, 2017 by James Kennedy. 2017 Annual Meeting is in the books! Thanks to all that attended! This entry was posted in Uncategorized on September 19, 2017 by James Kennedy. This entry was posted in Uncategorized on August 15, 2017 by James Kennedy. 2017 Golf outing – Fun in the Sun! The field has been set! 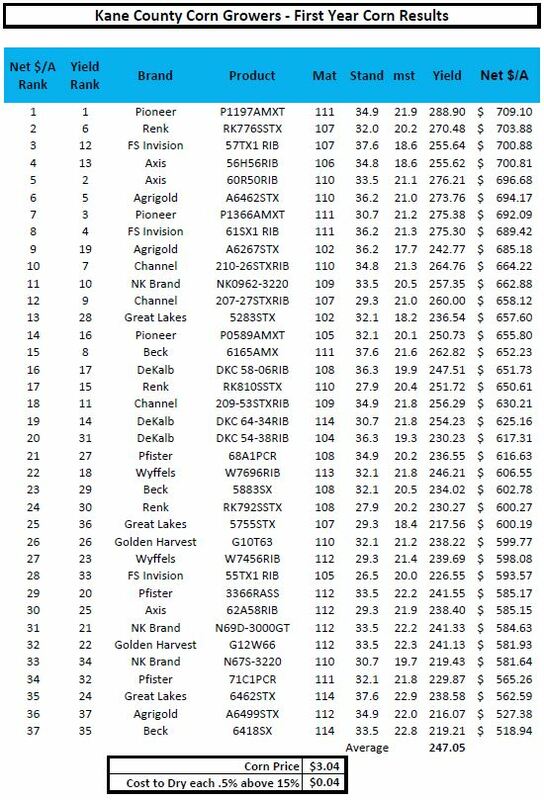 We are excited to announce that our 2017 corn plot is set and ready to go. We will be planting 37 hybrids this year! Each hybrid will be planted in both corn on corn and first year corn ground and will be replicated and randomly placed. We will update you with our progress as we go. Good luck to all the participating seed companies. This entry was posted in Uncategorized on May 4, 2017 by James Kennedy. THE NEW 2017 SCHOLARSHIP APPLICATION IS NOW AVAILABLE. CLICK THE LINK BELOW TO DOWNLOAD THE FORM AND INSTRUCTIONS. APPLICATIONS ARE DUE APRIL 1, 2017. GOOD LUCK! This entry was posted in Uncategorized on February 2, 2017 by James Kennedy. The Kane County Corn Growers Association invites you to participate in our 32nd annual corn hybrid plot. Please refer to the “Test Plot” page for more information and to print the 2018 Plot Registration Form. This entry was posted in Uncategorized on January 5, 2017 by James Kennedy. Our fiscal year is once again coming to a close. We would like to thank you for your continued support as a member of our organization. 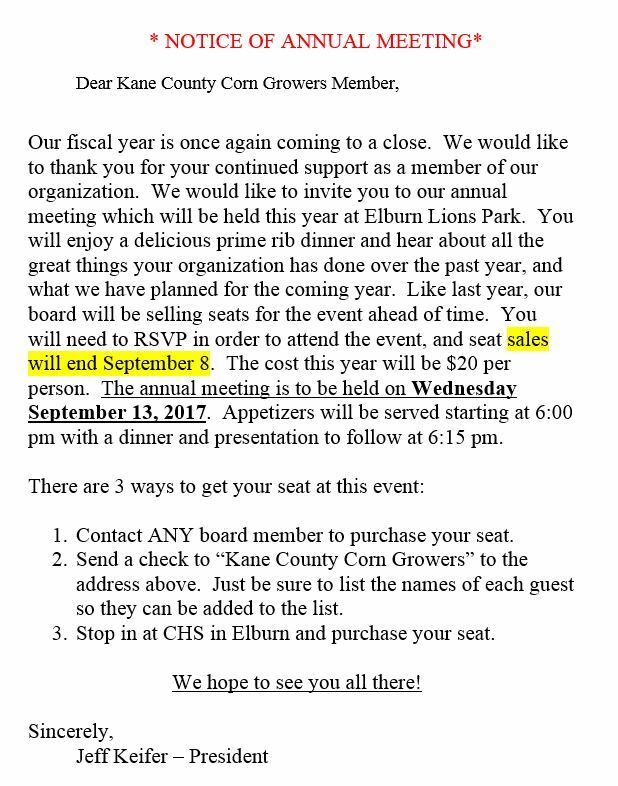 We would like to invite you to our annual meeting which will be held this year at Elburn Lions Park. You will enjoy a delicious prime rib dinner and hear about all the great things your organization has done over the past year, and what we have planned for the coming year. Like last year, our board will be selling tickets for the event ahead of time. You will need a ticket to attend the event, and ticket sales will end a few days prior to the event. The cost this year will be $20 per person. The annual meeting is to be held on Wednesday September 14, 2016. Appetizers will be served starting at 5:30 pm with a dinner and presentation to follow at 5:45 pm. Contact ANY board member to purchase your ticket. Send a check to “Kane County Corn Growers” to the address above. Just be sure to list the names of each guest so they can be added to the list. Stop in at CHS in Elburn and purchase your ticket. This entry was posted in Uncategorized on August 19, 2016 by James Kennedy. A BIG THANK YOU TO THE DEKANE SNOW TRACKERS SNOWMOBILE CLUB! 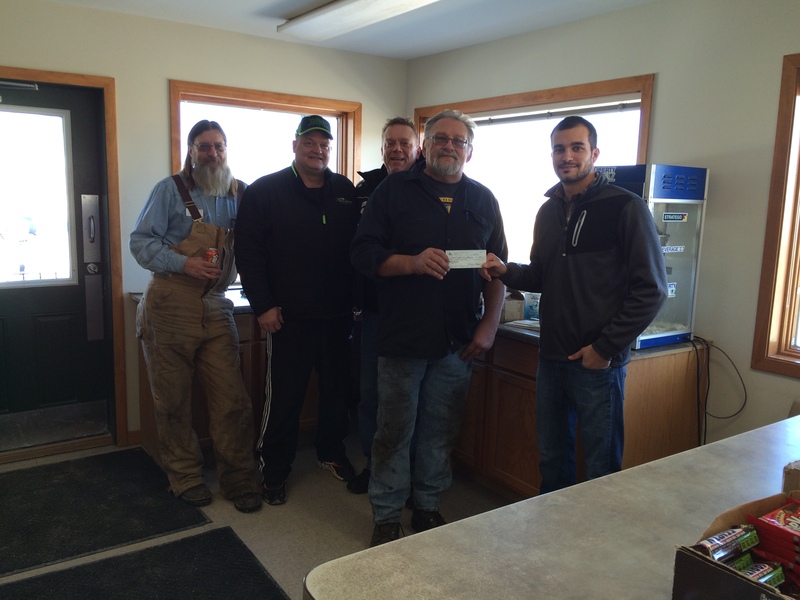 Last Wednesday, the local snowmobile club made a generous donation of $500 to the Kane County Corn Growers. Every winter, the snowmobile club relies on local farmers to allow them to groom trails through the fields. This year, they wanted to give something back. We accepted the donation, and will use the money as part of our scholarship program to give back to the community. We thank you for your donation! This entry was posted in Uncategorized on February 2, 2016 by James Kennedy. Scholarships are once again being offered by the Kane County Corn Growers to our members and members children. Be sure to check back to the scholarship section of the website in February to download an application. All applications will be due by the end of April and winners will be announced in July. Email Jeff Keifer at jeffk@elburncoop.com with any questions. This entry was posted in Uncategorized on December 23, 2015 by James Kennedy.